Content by Tony Macklin. Originally published on June 22, 2014 @ tonymacklin.net. In Jersey Boys, director Clint Eastwood goes sauntering into the past. He's in a foreign country. Clint was born in California, so some of the musical experience of the '50s-'60s is alien. He's not an Easterner. He can't remember growing up in New Jersey, New York, or Philly, where doo-wop from city streets was natural. Clint's Jersey Boys is more a series of postcards than a remembered, personal experience. Although it has its moments, Jersey Boys is somewhat stilted, not rhythmic. It's disjointed. The past wasn't drab as it is pictured in Jersey Boys. The movie lacks the energy and vitality of The Buddy Holly Story (1978), although it steals one of its scenes. It's ironic that Clint - known as the man of action not words - gets bogged down in conversations. Jersey Boys - based on the Tony-winning Broadway play - is the tale of the rise and decline of Frankie Valli and The Four Seasons. Marshall Brickman - a former member of The Tarriers - wrote the musical book for the play with Rick Elice. He wrote the screenplay with Elice. Brickman's last, previous screenplay was in 1994 - 20 years ago. Brickman was born in 1939, and Eastwood as born in 1930. That's 158 years of past. But it's more weight than lilt. 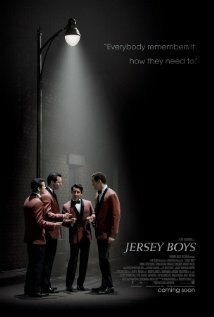 Jersey Boys opens in 1951 and stumbles at the start with an introduction that is heavy on string music and has cinematography that seems washed-out and artificial. No, the past was real. The end of the film relies too much on hackneyed shots of audiences applauding - tried-and-not-so-true. The cast is proficient, but only Christopher Walken, as mob boss Gyp DeCarlo, has pizzazz. John Lloyd Young is credible as Frankie Valli, and the rest of the cast is acceptable. The movie has some engaging scenes, e.g., song writer Bob Gaudio's (Erich Bergen) introduction to the group. But various scenes of arguments are almost toneless. Eastwood has always liked to surprise. His career is full of unexpected moves. In director Don Siegel's The Beguiled (1971), Clint played a vain, wounded Union soldier in the Civil War, who was outwitted and fell victim to young girls in a boarding school in the south. No Dirty Harry there. As director himself, Eastwood took Siegel's range to even greater expanse. In The Bridges of Madison County (1995), he directed and starred opposite iconic actress Meryl Streep. In Midnight in the Garden of Good and Evil (1997), he directed a film about homosexuality and a killing in Savannah, Georgia. In Million Dollar Baby (2004), he starred and directed a film about boxing - female boxing. The Changeling (2008) focused on a woman and the loss of her child. In Letters from Iwo Jima (2006) he took a remarkable step. He made a film about World War II, from the Japanese point of view. The Japanese point of view! Is there any other director who could have made a mainstream movie like that? When he was named director of Jersey Boys, it was a surprise. But it's also surprising how conventional the film is. Clint has a long history of interest in music. He sometimes sang as Rowdy Yates in tv's Rawhide. He was in the ill-advised musical movie Paint Your Wagon (1969), where his voice was a little better than Lee Marvin's. A major theme in Clint's films is about a character seeking redemption. Jersey Boys may be Clint's penance for Paint Your Wagon. It could be called Paint Your Jersey Boys. The first film Clint directed was Play Misty for Me (1971), which is steeped in music. He directed Bird (1988) about legendary Saxophonist Charlie Parker. Eastwood has contributed to the soundtrack of 25 of his movies, and he was composer of 8. There's a bit of his tinkling piano in Jersey Boys. He has taken tinkling piano about as far as it goes. Jersey Boys takes us into the past. People react to the past in different ways. Once when I returned for a high school reunion in Philadelphia, I was greeted by people who remembered enthusiastically that I had gotten Bill Haley and the Comets for our prom. I had forgotten. Sometimes the past is stashed somewhere in the attic of the mind. A film like Jersey Boys can bring the past flooding back with vibrance and vitality. Or it may not. I preferred The Four Lads to The Four Seasons. The Four Lads backed up Johnny Ray on the songs "Cry" and "The Little White Cloud that Cried." I saw Johnny Ray at the Mastbaum Theater in Philly. I also saw a concert with Jerry Lee Lewis and LaVern Baker. She brought down the house belting out "Jim Dandy to the Rescue." I went to tv's Bandstand wearing a loud jacket. All these experiences were magical. Going to the past can be an act of magic. In Jersey Boys, Clint Eastwood is a stylist, not a magician. In a scene in Jersey Boys in a diner, Frankie is talking to Bob. He says, "Why does everybody leave?" The song "Stay" is playing on the jukebox. It's a nice dichotomy, and it may capture Eastwood's dilemma. He's in the dwindling present. But Clint's dwindling present is still worthy of vast regard.